Most people know that too much sun exposure is bad for the skin, but did you know that your eyes are also vulnerable to sun damage? In fact, extended exposure to the UV radiation generated by the sun has been linked to many eye issues that can negatively impact a person’s vision, including cataracts, macular degeneration, pterygia, pingueculae, and photokeratitis. A quality pair of sunglasses can provide invaluable protection, and the many benefits of polarized lenses make them an especially good choice. When you polarize something, you restrict transverse waves, like light waves, to influence their direction. In the 1930s, inventor Edwin H. Land produced the first inexpensive filters capable of polarizing light by creating a film of perfectly aligned, micrometer-sized polarizing crystals. The technology had many scientific applications and found a practical use that people everywhere could appreciate in the form of polarized sunglasses. Because they can bounce off surfaces, the sun’s rays come at your eyes from a multitude of directions. While normal lenses block light from all directions equally, polarized lenses go a step further; their built-in filter only allows vertical light rays to pass through. This protective feature offers significant advantages. When light bounces off a flat plane like a car’s hood or the surface of water, these horizontal light rays bombard your eyes and create issues with blinding glare or ghostly reflections. In most situations, polarized lenses will eliminate these problems because they block virtually all horizontal rays. Many people choose polarized lenses because of the amazing quality of vision they offer. The view through polarized lenses is crisp and clear. Colors may appear a bit darker, but they remain true. This clarity enables those who are wearing them to see their surroundings in greater detail. 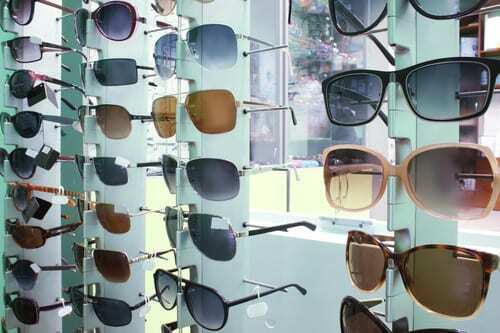 In bright conditions, wearing polarized sunglasses may help you better appreciate the beauty of the world around you. Trying to penetrate the blinding fog that is glare can be incredibly difficult for the human eye. By blocking glare and reducing ghostly reflections, polarized lenses make it easier for the eyes to do their job. The result is reduced eye strain and improved comfort, so you can relax and enjoy activities in bright surroundings for longer periods. That’s part of the reason that polarized lenses are so popular with people who delight in being outdoors. In fact, polarized lenses are especially beloved by fishermen and boaters. Without their protective polarizing filters, glare makes the surface of the water opaque and impenetrable, blocking the view of both fish and potential hazards lurking beneath the surface. By fending off the horizontal rays that cause glare, polarized lenses allow outdoorsmen to peer beneath the waves. The eyestrain that results from the struggle to see in glaring situations can trigger headaches in many people. Migraine sufferers are particularly vulnerable, especially if a bright or flashing light is a trigger for them. Since polarized lenses form a shield that limits the amount of light and glare that pass through to reach the eyes, wearing polarized sunglasses may help some people avoid headaches. Better vision allows you to spot hazards and avoid danger, so by reducing glare and improving clarity, polarized lenses can allow you to complete tasks more safely. In fact, the clearer vision offered by these lenses can actually make it easier for your brain to determine what it is that you’re seeing. You’ll be able to evaluate your surroundings more efficiently and respond to them more rapidly. This is a major advantage when you are doing things where response time is important, like driving a car, piloting a plane, or steering a boat. Sight is important, so taking steps to protect your eyes just makes sense. Wearing sunglasses that shield your eyes from UV radiation whenever you’re spending time behind the wheel or outdoors is a good start, and opting for polarized sun lenses is even better. How much of a difference can polarization make? If you would like to see for yourself, stop by Heffington’s and ask for our in-office demonstration. To learn more about the benefits of polarized lenses or to schedule an appointment to discuss your eye health or vision, please contact us today.